The rain moved out after dark yesterday evening. We went to bed with droplets of water dripping from the leaves of the oak tree in our front yard ticking on the metal roof. Today is the first day since the start of summer that I could breathe without laboring. I kept checking in the mirror to make sure nothing changed about my face. I worry that the next step in the evolutionary ladder for people who live in Alabama is to grow gills to better cope with humidity. The lawn loves all the rain. So do mushrooms. They seem to grow while blinking my eyes. I snapped the picture below while cutting grass around the barn. The next few days should be like summers past. I plan to enjoy each sunny day. Nice mushroom photo. I'm not a fan of humid weather especially when it's hot. I'm glad you can breath easier. I find as I get older, I dislike humidity more and more. 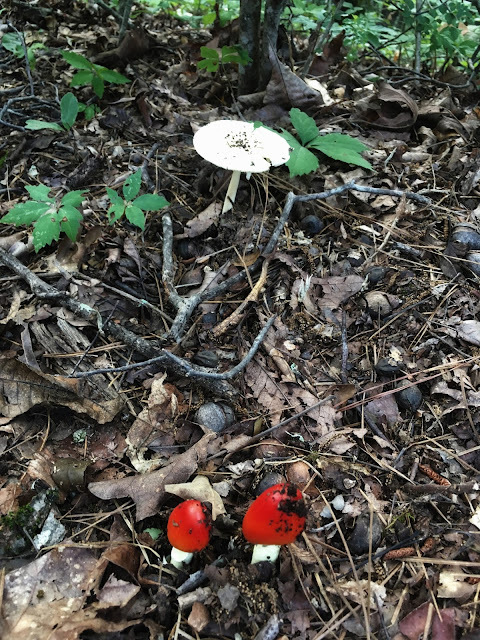 I took so many mushroom photos when I lived in Alabama! Great photo,nostalgic for me. FL isn't much better for breathing. BTW added the follow to my blog, thanks! We never touch mushrooms and we warn all the kids visiting to never touch wild mushrooms. Love those red mushrooms. Loathe and detest humidity (and the sweaty season really). good post. Here in Florida it is VERY HUMID. Mama was thinking of coming down early, but Imma thinking this 4 days has changed her mind. LOL Those 'red heads' are really THERE! I've never seen a red mushroom before. We have plenty of the white ones though. Humidity makes a huge difference in the heat. I cannot take much of it anymore. Have even taken to mowing the yard half one day and half the next. It's wonderful when we get those days when it's low. The red mushrooms are new for me also, glad you got a break from the rain, send some my way if you can Rick. Enjoy each sunny day that sounds like an excellent plan. Mushrooms have always intrigued me, even though here in Oregon people often get terribly sick picking and eating them. Mushroom apparently can grow wherever there's enoght humidity. This is from a post I wrote about Maui: Jack & Jane ran their air conditioning constantly & it apparently couldn’t handle the stress. One day Jack came out of the condo & said to Jane, “I didn’t even know you’d planted a crop, but it’s ready for harvest.” Moisture must have been running out of the A/C vent because there were actual mushrooms growing in the carpet just below it.